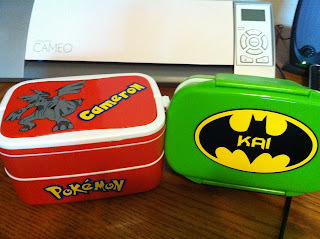 I love bento boxes! I've had some in my Amazon wishlist for a really long time, but just recently, I was lucky enough to come across some of these great bento boxes at Tuesday Morning. While the colors were bright, they were missing some pizazz... so I asked the kids what they wanted. 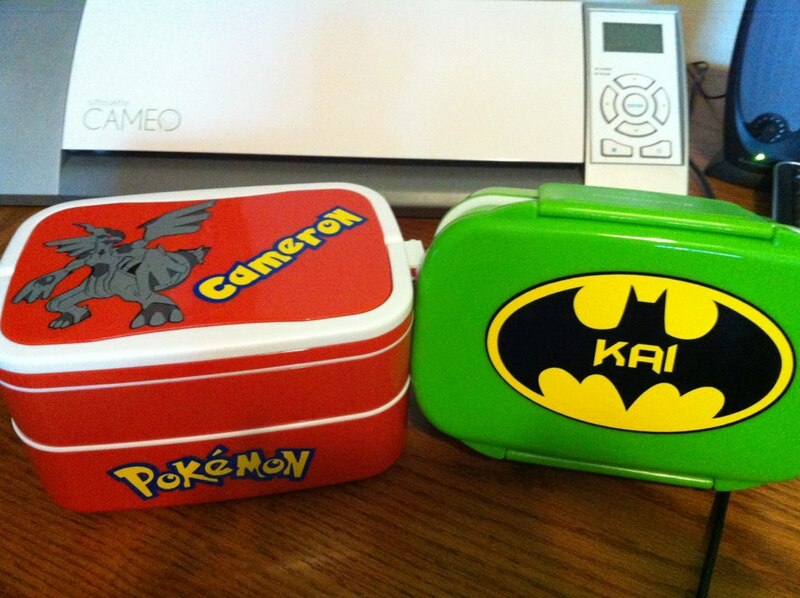 Kai, of course, chose Batman; and Cameron chose Pokemon. I'll admit that the Batman one was much, MUCH easier to accomplish. The Batman logo was in the Silhouette store and after I downloaded a free Batman font from dafont.com, all I had to do was add Kai's name, cut and vinyl. With Cameron's, well... it was just a nightmare from the get-go. I couldn't find any Pokemon files that I wanted and he was very specific about wanting Zekerom on his lunchbox. I was able to find a pretty clear image of the dragon/bumble bee guy, trace it, and then start cutting and layering the vinyl. It took a total of 5 colors to complete him. A base layer of black, then light gray and dark gray for the body, blue tip on the horn, and a teeny tiny red eye. 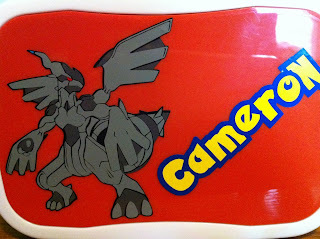 For the Pokemon logo, I was able to trace and cut with no problem. Cameron's name, however, took a bit more work. I won't go too into detail, but I noticed that the Pokemon font didn't have the vowels overlapping and cutting into the other letters like the logo did. With my crafting OCD, this was unacceptable and I spent a good hour to an hour and a half playing in the Silhouette software to cut chunks out of the letters surrounding the vowels and crowding the letters to look more "authentic". Finally, I was able to put everything on there and proudly show my project to the children. The kids, of course, nodded and said, "Nice, Mom. Thanks." Hmm.. not exactly the whooping and screaming reception I was hoping for, but I was happy with how they turned out anyway.